Hume castle was the family seat of the Earl of Home at the time of Flodden and a muster point of the Home contingent before the invasion in August 1513. In 1515 it also featured in the aftermath of the Battle when Albany decided Home would be a scapegoat for the loss and waged a campaign against the family - eventually leading to the hanging of Home as a traitor for abandoning the battlefield in 1513. In 1547 the Duke of Somerset captured the castle despite its defences having been strengthened by the French. The 4th Lord Home recaptured it the following year, putting the garrison to death. It was then used to store captured English guns. This was to be but one of many violent incidents in the castle’s long and bloody history. 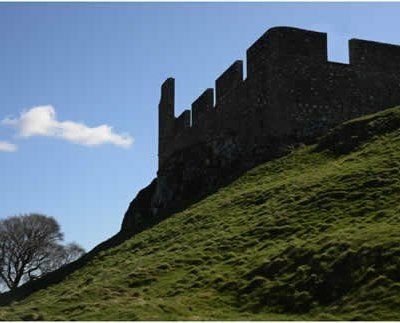 Hume Castle is the heavily modified remnants of a late 12th or early 13th-century castle. The village of Hume is located between Greenlaw and Kelso in Berwickshire. Standing as it does, on an impressive outcrop, it commands fine views to the English border. It had historically been used as a beacon station to warn of invasion. Its enormous walls were created in the 18th century as a folly but remnants of the central keep and other features can still be seen. The lands of Home or Hume were first granted to Ada, his daughter, by the 6th Earl of Dunbar & March. She married her cousin William of Greenlaw, whereupon he became known as William of Home sometime before this date. It is the original seat of the Home family from which they take their name. It is an example of one of the earliest castle types in Scotland with a rectangular courtyard plan, unusual in the South, being more often found in the West Highlands. From its earliest times it was a beacon station for warning of invasion from England. It was the only Borders castle not destroyed in Robert Bruce's scorched earth policy in 1313. In 1460 King James II of Scotland and his queen, Mary of Gueldres, were staying in the castle during the siege of the English-held Roxburgh Castle. During the siege the king was killed by a gun (sited at nearby present day Floors Castle) which exploded as he set the fuse. The Duke of Somerset captured Hume in 1547 despite its defences having been strengthened by the French. The 4th Lord Home recaptured it the following year, putting the garrison to death and therafter it was used for the storage of captured English guns. In 1569 Hume was taken again by the Earl of Sussex and burnt, following the 5th Lord Home's renewed support of Mary Queen of Scots. Colonel Fenwick attacked the castle on behalf of Oliver Cromwell and the artillery bombardment reduced the castle to a ruin in 1651. Following the sale of the barony of Home by the Earl of Home to Sir Hugh Hume of Polwarth, 3rd Earl of Marchmont, the castle walls were re-constructed in their present form in 1789 , the original 13th century portions being still visible in part. Hume was still a beacon station warning for invasion, now from Napoleon. On the night of 31st January 1804 a serjeant of the Berwickshire Volunteers in charge of the beacon mistook charcoal burners' fires on Dirrington Law for a warning and firing his at Hume, set in train the lighting of all the Borders beacons to the West and a turn-out of 3,000 volunteers in what became known as 'The Great Alarm'. In 1929 the castle and surrounding land was bought by the Secretary of State for Scotland, it having been previously sold from the Marchmont Estate before the 1914-18 war. The Berwickshire Civic Society became tenants and took on the task of administering funds provided by the Scottish Office for the restoration of the castle walls ' the castle having been closed to the public since the early 1980's. The castle was re-opened to visitors in 1992 and the Society became outright owners of the castle in 1995.Ownership of the castle returned to the Humes after an interval of approximately 100 years, when it was acquired by the Hume Castle Preservation Trust in 2005, sponsored by the Clan Home Association. Visitors enter the castle entirely at their own risk and are respectfully reminded that it is forbidden to climb on any part of the castle other than the viewing platform. None. Please place litter in the bins adjacent to the entrance. Parking: Use the small car park at the foot of the castle. 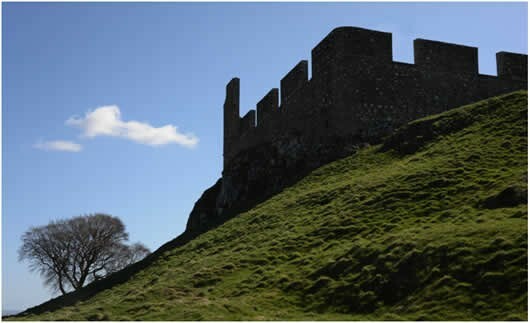 Travelling north from Kelso to Greenlaw on the B6364 the castle is very prominent on your left after about 4 miles.